I Used to work at Boeing and know a bit about aerodynamics. Yes the little sizes will not work for a 11 ft. high or bigger RV fifth wheel trailer. To work well and for a good payback of money and time we needed to find Something BIG like on a semi truck day cab. Like I said, I now a little about aerodynamics and a deflector has to with the size; height and width of the truck be equal to about 75% of the trailers. If the deflector or combination of them is not this high and wide then it just won't work well enough to bother. In physics terms the deflector needs to create a air flow pattern at highway speeds that with the lowest drag coefficient or it's own lowest possible air resistance; direct the oncoming air up and around the front of the RV 5th wheel trailer. The wind deflector has to be as aerodynamic shaped and be set at a LOW angle of about 30 degrees. That means that a RV cab over deflector for a RV 5th wheel trailer needs to be about 6 ft. wide and stand at least 3 ft. high above the cab of the RV pickup cab. Also like you said the deflectors have to be wider to get the air movement around the sides of the trailer. Just tell people a good deflector shape should look like the top nose of a cargo or transport air plane and be 6 ft. wide x 3 ft. high, that they'll understand. After searching the Web for a bit I found a BIG RV fifth wheel trailer wind deflector that comes with a pair of side wings. We have been traveling around all summer and the truck has picked up a good 20%.of MPG. Me and a buddy put the cab over wind deflector and the side wings on in about a hour. Hey after driving south about 1000 miles there was only a few bugs on the trailer to clean in a few minutes; for me that's time fishing or golfing rather than cleaning. Well for me the No or a little trailer bug and debris time that is saved cleaning on the trailer after every trip is worth the deflector alone. Heck spending a hour or two cleaning the trailer is not pleasant. The wife likes it because I am a Happier person and she gets to figure on what else to spend the money we saved on. The mounting brackets that came with it lets the cab over deflector lay down in a couple of minutes with the air going through it. They have another hinge bracket I might try that lets it lay down behind and below the cab, a nice gismo feature. I park the truck under a high car port so there is not a problem with clearance most of the time. It is too bad that the education at the schools don't teach basic science or physics more effectively so people would learn how to apply it/them for their benefit. We got the cab over deflector and the side wings at wind-tunnel-designs.com. So some things out there do really work. Read more about how Bob installed and uses RV Air Deflector. You may also want to read: RV Air Deflectors for Travel Trailer and Fifth Wheel Tow Vehicles do They Work? 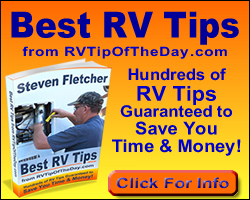 - RV Air Deflectors, Do They Work?